Discussion in 'Wood / Woodwork / Carpentry' started by morpheus83uk, 4 Jan 2017. I am wondering what sort of router bits people would recommend. I am starting out with a router and would need some bits. I am wondering people would recommend sets of bits and if so what sets would be people recommend? I have seen these https://www.amazon.co.uk/Yonico-177...9883&sr=1-12&keywords=router+bit+set+1/2+inch which look like a fairly comprehensive starter kit but I am unsure as to their quality. 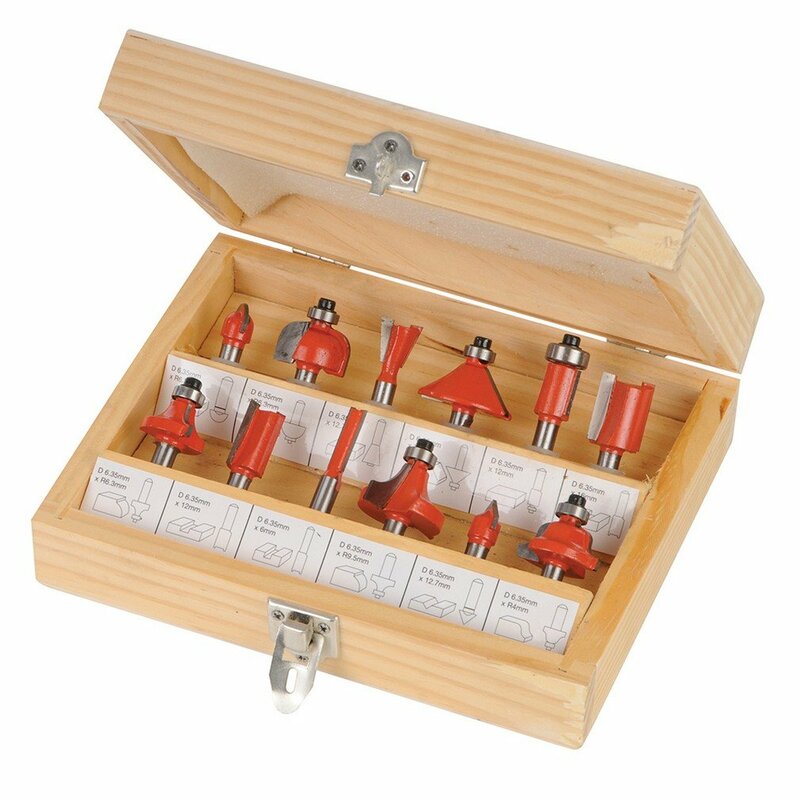 I appreciate there are thousands of router bits out there and I can buy specific kits to do specific jobs such as tongue and grove and dado bits (as these were shown on a website I was looking on at the time). I am after something which is good quality lasting me a while as well as being fairly comprehensive so meeting most of the jobs I would be doing. All suggestions are welcome about the bits mentioned and your own personal experiences with bits. What size of router and what sort of jobs are you hoping to do? Personally think sets are a waste of time, you will use less than a handful and the rest will sit rusting in the shed, buy what you need for each job and buy quality. It's a half inch collet dewalt router and I will be doing some chamfering, rounding and grooving in some aspects as well as creating holes for things such as candle holders as the things at the moment. I am lookng at something which will last a good while and will be a good variation of bits which will cover what I need and possibly more if required. I hope that helps in some respect? As Foxhole says buy the cutters you need for the task at hand. If you buy a set there will always be cutters you don't use and the selection will inevitably influence what you do rather than you deciding (really, because it's only natural to want to get your money's worth out of that set, isn't it?). In addition Yonico aren't good value for money. I buy Trend, Freud and Wealden in the main - probably more Wealden than the rest because their service is excellent, their prices attractive (to me) and their quality whilst not in the Trend Professional or Titman league ir more than good enough for medium to heavy Trade use and miles better than many cheaper Chinese brands. Thanks so essentially buy the bits I am going to be using. If that's the case how do people store their bits? I did look at the set which was linked above does that show which bit is which inside the case? I was thinking a decent set so th eery could be easily stored and found when required is all. I use lots of Wealden or trend too. I agree on the set thing too, most will be profiles you won't need or in the wrong size. At under £2 a pop they ain't going to be any good spend the money on some decent ones that you will use. So what would people recommend for the above? Is it better to buy a set of specific bits like a set of chamfer bits for example? Do these exist? Or is it better to buy individual bits? Thank you for the link I will have a look around for something similar if individuals are the way to go in my situation. I would suggest you get a very cheap set of bits and use them to learn with. Once they're knackered you can throw them away or use them for rough work, by which point you will have figured out what expensive bits you actually need. Cut the foam into pieces that fit sideways in the sections of the box, and in each piece of foam push and twist the copper pipe into the face of it twice to make two holes - each hole will take a 1/2" cutter and the foam stops them banging together. For templating the most useful sizes are something like 16 and 30mm (at least for a tradesman as those are the two sizes used on the vast majority of templates by Trend and their competitors) and a useful straight cutter might be 12mm diameter to go with these (again, same reason). TBH the average user doesn't need a huge selection of template guide bushes - those two will cover a lot of the requirements you'll have, at least until yopu've become more adept at using the router. How long do router bits last?